How do I use a variable in an IN clause? I see this question in one form or another a lot. I’ve seen this or something like it probably half a dozen times in the last couple of weeks on the forums I read. To the point where it even showed up in a dream the other night (I know, weird hu?). Just to be clear I’m talking about trying to do something like this. So to answer the title question, it doesn’t work. It can’t be made to work. Give it up. It would be nice if it did, but it doesn’t. There, that’s over. Now that we are clear that this particular piece of code won’t work I know of 3 viable workarounds that I’m going to discuss. 1st – Using LIKE. This is by far the most restrictive of the three options. It will only really work well with numbers or strings where you can be sure that there won’t be a comma in the string. Another big drawback is speed. Because of the way it’s written you aren’t going to get much use out of indexes. The benefit to this method is it’s quick and easy to write. It’s primarily useful if you are writing an ad-hoc query with a small enough table that speed isn’t a huge issue. You can also use split functions with CROSS APPLY if you have a column that has a delimited list. This is a bit off scope from what I’m discussing so I’m not going to put an example here but Jeff put a couple in his discussion of his split function. 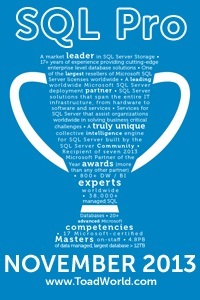 3rd – Dynamic SQL. If you like dynamic SQL and use it on a regular basis then this one is nice and easy and certainly my favorite. If however dynamic SQL is not something that you feel comfortable with then you might just go with method #2. One of these days Microsoft may allow variables in query statements like this but I’m not going to hold my breath. In the mean time these are the three methods I know of to handle a variable “IN” clause. There may be others and if you know one I would love to hear about it. Got to love typo’s. Thanks! I’ll fix it now. Not sure I understand what you mean? I think what he is trying to say is that your dynamic SQL example works as long as the values in the series are numeric. However, if the values are characters or alphanumeric it fails: example SET @InList = ‘A,B,C,D’. Absolutely. And if you have a large number of values then performance is going to be better using a temp table/table variable too.